New York Times bestselling author Diana Gabaldon has captured the hearts of millions with her critically acclaimed novels, Outlander. Dragonfly In Amber, Voyager, and Drums Of Autumn. From the moment Claire Randall accidentally steps through a magical stone that transports her back in time more than 200 years to 1743, and into the arms of Scottish soldier Jamie Fraser, readers have been enthralled with this epic saga of time travel, adventure, and love everlasting.Now Diana Gabaldon has written the ultimate companion guide to her bestselling series, the book only she could write - a beautifully illustrated compendium of all things Outlandish. As a special bonus for those who are eagerly awaiting the next appearance of Jamie and Claire, she includes never - before - published excerpts from upcoming works in the series. And there's lots more in this lavish keepsake volume for the many devoted fans who yearn to learn the stories behind the stories:- Full synopses of Outlander, Dragonfly in Amber, Voyager, and Drums of Autumn - A complete listing of the characters in all four novels, including extensively researched family trees and genealogical notes- Professionally cast horoscopes for Jamie and Claire- A comprehensive glossary and pronunciation guide to Gaelic terms and usage- The fully explicated Gabaldon Theory of Time Travel- Frequently asked questions to the author and her (sometimes surprising) answers- An annotated bibliography- Tips, personal stories - even a recipe or two- Essays about medicine and magic in the eighteenth century, researching historical fiction, and moreWith the insight, humor, and eye for detail that has made her novels such an outstanding success story. 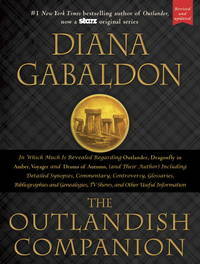 Diana Gabaldon here gives her readers the best gift of all--The Outlandish Companion.From the Hardcover edition. 1999-04-01. New. Ships with Tracking Number! INTERNATIONAL WORLDWIDE Shipping available. Buy with confidence, excellent customer service! Delacorte Press, 1999. First edition, first printing. Fine in fine dust jacket, in mylar cover. Part of the Outlander series. Inscribed byt he author. 2015-07-07. New. Ships with Tracking Number! INTERNATIONAL WORLDWIDE Shipping available. Buy with confidence, excellent customer service! DELACORTE. New. 9.49 x 7.04 cm. Delacorte Press. Hardcover. 0385257392 Signed Canadian first edition, first printing. Signed on the title page by author. Contains number line 1 2 3 4 5 6 7 8 9 10. Virtually no wear to jacket. Jacket is NOT price clipped. Covers are clean and bright. Edges are sharp. No tears or creases. The book itself is in Near Fine condition. The binding is straight and tight. NO remainder mark. All books are marked down 35% until February 1, 2019. Start stocking up now! . Fine. Doubleday Canada, 1999-01-01. 1st Canadian Edition. Hardcover. Used:Good. 2015-02-08. Good. Ships with Tracking Number! INTERNATIONAL WORLDWIDE Shipping available. May not contain Access Codes or Supplements. May be ex-library. Shipping & Handling by region. Buy with confidence, excellent customer service! Delacorte Press. Hardcover. 0385324138 Signed and inscribed by the author. In Good, mylar wrapped dust jacket. . Very Good. 1999. NEW YORK: DELACORTE, 1999. 1ST EDITION 1ST PRINTING. HARDCOVER. FINE/NEAR FINE. NEW YORK: DELACORTE, 1999. 1ST EDITION 1ST PRINTING. FINE/NEAR FINE. SIGNED BY AUTHOR. Delacorte Press, New York 1999. Hardcover. Book Condition: Fine. Dust Jacket Near Fine. SIGNED by author on title page with no inscription. First Edition,First Printing. Signed on the title page by author. Contains number line 1 2 3 4 5 6 7 8 9 10. Virtually no wear to jacket. Jacket is NOT price clipped. Covers are clean and bright. Edges are sharp. No tears or creases. The book itself is in Fine condition with very minor bumps to spine. The binding is straight and tight. NO remainder mark. Archival cover. Oversized book so extra postage. Delacorte Press. Near Fine in Very Good+ dust jacket. 1999. 1st Edition; 1st Printing. Hardcover. 0385324138 . Hardcover with dustjacket, first printing as indicated by the publisher's "1" in the number line on copyright page, inscribed and signed by the author on a bookplate affixed to the first blank end-paper: "To Pam Nesbit - Le meao! [? ] Diana Gabaldon." Book is clean inside and out, binding is tight, contents are fine, no remarkable flaws, jacket has a 2.5 inch thin strip of fading to the red color on the top edge of the front panel and mild rubbing on the rear panel, the jacket is clean and pleasing to the eye overall, the original price is present and a professional (removable) mylar cover is included, "In which much is revealed regarding Claire and Jamie Fraser, their lives and times, antecedents, adventures, companions, and progeny, with learned commentary (and many footnotes) by their humble creator" ; Signed by Author . Delacorte Press. Hardcover. 0385257392 Like New Condition. . Fine. Delacorte Press. Hardcover. 0385257392 New Condition. . New. Delacorte Press. Hardcover. 1101887273 Please allow 4 - 14 business days for Standard shipping, within the US. Thank you for supporting our small, family-owned business! . New. 2015-03-31. Revised, Updated. 1999-04-01. Good. Ships with Tracking Number! INTERNATIONAL WORLDWIDE Shipping available. May not contain Access Codes or Supplements. May be ex-library. Shipping & Handling by region. Buy with confidence, excellent customer service! Delacorte Press. Hardcover. 0385324138 New Condition. . New. Delacorte Press. Hardcover. 1101887273 New Condition. . New. Delacorte Press. Hardcover. 0385324138 First edition, First Printing. Signed by the author on the title page. Not inscribed, price clipped or otherwise marked. Securely wrapped, dust jacket in protective cover and shipped in a box. Full # line starting with a 1. . Fine. Delacorte Press. Hardcover. 1101887273 Please allow 4 - 14 business days for Standard shipping, within the US. Thank you for supporting our small, family-owned business! . Fine. 2015-03-31. Revised, Updated. Delacorte Press. Hardcover. 0385324138 Please allow 4 - 14 business days for Standard shipping, within the US. Thank you for supporting our small, family-owned business! . Fine. 1999-06-29. First Edition. Delacorte Press. Hardcover. 0385324138 Please allow 4 - 14 business days for Standard shipping, within the US. Thank you for supporting our small, family-owned business! . New. 1999-06-29. First Edition. New York: Delacorte Press. Near Fine in Near Fine dust jacket. 1999. First Edition; Second Printing. Hardcover. 0385324138 . Signed by Author; Only slight wear; Inscribed by the author. A bright, solid book, dustjacket in Mylar, unclipped. ; B&W Illustrations; 9.50 X 7.50 X 1.80 inches; 567 pages; "As with the guides to the Hobbit tetralogy and the fiction of Stephen King, Gabaldon offers a companion volume to her Outlander Series four time-travel historical romances, Drums of Autumn (1997), etc., in which she tells us much is revealed regarding Claire and Jamie Fraser, their lives and times, antecedents, adventures, companions and progeny, with learned commentary (and many footnotes) by their humble creator. She also provides full synopses of the four novels and includes excerpts of forthcoming books in the Claire and Jamie Fraser series. Listed, too, are all the novels characters, their origins and family trees, horoscopes, and sketches of clan badges and shields, along with genealogical notes. For non-Gaelic readers, Gabaldon assembles a glossary and pronunciation primer. Additionally, she supplies details on her research, E-mail excerpts, notes on herbal medicine, illustrations, and recipes, plus a huge bibliography. Gabaldon fans who have followed the story of British Red Cross nurse Claire Beauchamp Randall will welcome this act of buoyant hubris by a vividly entertaining author whose later installments have turned into baggy-pants behemoths of 900 pages." . Doubleday Canada. Hardcover. VERY GOOD. Light rubbing wear to cover, spine and page edges. Very minimal writing or notations in margins not affecting the text. Possible clean ex-library copy, with their stickers and or stamp(s). Delacorte Press. Hardcover. 0385324138 First edition, Later Printing. Signed by the author on the title page. Not inscribed, price clipped or otherwise marked. Securely wrapped, dust jacket in protective cover and shipped in a box. Fine/Fine . Fine. Delacorte Press. Hardcover. 0385324138 New Condition *** Right Off the Shelf | Ships within 2 Business Days ~~~ Customer Service Is Our Top Priority! - Thank you for LOOKING :-) . New. Delacorte Press. Hardcover. 1101887273 Please allow 4 - 14 business days for Standard shipping, within the US. Thank you for supporting our small, family-owned business! . Fair. 2015-03-31. Revised, Updated. Delacorte Press. Hardcover. 1101887273 Special order direct from the distributor . New. Delacorte Press, 2015-03-31. Hardcover. Used:Good. U.S.A.: Delacorte Press, 1999. Hardback in near fine condition with fine dust jacket. Revised and updated edition, 1999.. Hardcover. Near Fine/Fine. Delacorte Press. Hardcover. 1101887273 Like New Condition. . Fine. Doubleday Canada, 1999. Hardcover. Good. New York: Delacorte Press. 1999. First Edition; Twelfth Printing. Hardcover. 0385324138 . Very Good+ in a Very Good+ dust jacket. ; 9.50 X 7.50 X 1.80 inches; 608 pages; Original unclipped dust jacket protected by archival Brodart cover. All domestic orders shipped protected in a Box. .
Toronto: Delacorte Press. Very Good+ in Very Good+ dust jacket. 1999. First Edition; First Printing. Hardcover. 0385257392 . DJ and boards show very light shelf wear. ; A bright, solid book dustjacket in Mylar, unclipped. ; Outlander; 9.50 X 7.40 X 1.90 inches; 577 pages; ¸ Full synopses of Outlander, Dragonfly in Amber, Voyager, and Drums of Autumn¸ A complete listing of the characters in all four novels, including extensively researched family trees and genealogical notes¸ Professionally cast horoscopes for Jamie and Claire¸ A comprehensive glossary and pronunciation guide to Gaelic terms and usage¸ The fully explicated Gabaldon Theory of Time Travel¸ Frequently asked questions to the author and her (sometimes surprising) answers¸ An annotated bibliography¸ Tips, personal stories -- even a recipe or two!¸ Essays about medicine and magic in the eighteenth century, researching historical fiction, and more . Delacorte Press. Hardcover. 1101887273 . New.